From the QEW take the 20 Hwy exit. Travel southbound on 20 Hwy for about 2 kilometers to Barton Street. Turn right on Barton Street. Turn right on Woodward Ave (fifth stoplight). About 800 meters after the second stoplight on Woodward Ave you will see the entrance to the Hamilton Steam and Technology Museum on your right. It has a large red sign. From the QEW take the Woodward Ave exit. Turn left at the stoplights at the end of the exit ramp. You can see the powerhouse chimney ahead of you. 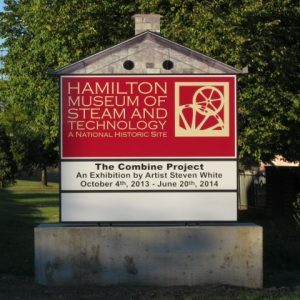 Travel about 500 meters and you will see the entrance to the Hamilton Steam and Technology Museum on your left. It has a large red sign. From northbound on the Red Hill Creek Expressway, take the Barton Street exit. Turn left onto Barton St West at the stoplights at the end of the exit ramp. Turn right on Woodward Ave (second stoplight). About 800 meters after the second stoplight on Woodward Ave you will see the entrance to the Hamilton Steam and Technology Museum on your right. It has a large red sign. From northbound on 20 Hwy turn left on Barton Street. Turn right on Woodward Ave (fifth stoplight). About 800 meters after the second stoplight on Woodward Ave you will see the entrance to the Hamilton Steam and Technology Museum on your right. It has a large red sign.